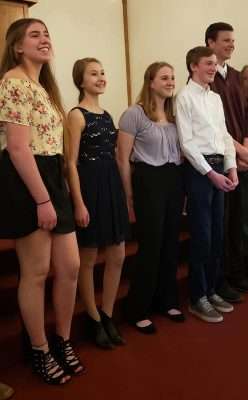 Five students along with an array of family and friends gathered at the Methodist Church in Quincy for the Rotary Club’s area wide speech and music contest held March 30. This performance represented the second level of competition for the high school students who competed in and won in their respective Rotary Club’s contest. Representing the Loyalton club was Ruth Meschery in music and Garrett Genasci for the speech contest. Portola’s representatives were Sophia Dutton (speech) and Jordan Herbert (music) and representing the Quincy Club was Sylvia Wood (music). Garrett and Sophia both gave excellent speeches, each capturing the essence of what being individually inspirational truly means. The music contest followed the speech contest with the exceptionally talented students entertaining the audience and judges. Sylvia performed a piece on her flute and another on the piano; Ruth performed on the piano, and Jordan with his clarinet. Taking the first-place honors and $250 were Sophia (speech) and Sylvia (music). They move on for a chance to take the top honors and win up to $1,000 at Rotary’s annual district-wide Speech and Music Contest on May 18 at the Peppermill Resort in Reno. Taking home $175 and second place were Garrett (speech) and Ruth (music). For his musical performance Jordon won $100.